Deep Yellow Limited (ASX:DYL) (OTCMKTS:DYLLF) (Namibian Stock Exchange:DYL) is a specialist differentiated uranium company implementing a new contrarian strategy to grow shareholder wealth. This strategy is founded upon growing the existing uranium resources across the Company's uranium projects in Namibia and the pursuit of accretive, counter-cyclical acquisitions to build a global, geographically diverse asset portfolio. The Company's cornerstone suite of projects in Namibia is situated within a top-ranked African mining destination in a jurisdiction that has a long, well regarded history of safely and effectively developing and regulating its considerable uranium mining industry. Deep Yellow Limited (ASX:DYL) (OTCMKTS:DYLLF) is pleased to announce an updated Mineral Resource Estimate for the Tumas 1, 2 and 3 deposits which, at a 200ppm eU3O8 cut-off now contains 67.4Mlb of Measured, Indicated and Inferred Mineral Resources at 352ppm eU3O8. This represents an increase of 51% from the MRE announced to the ASX on 11 July 2018. The Directors of Deep Yellow Limited (ASX:DYL) (OTCMKTS:DYLLF) submit herewith the financial report of the Company and its subsidiaries for the half-year ended 31 December 2018. 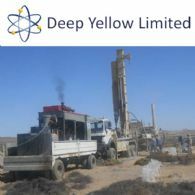 Deep Yellow Limited (ASX:DYL) (OTCMKTS:DYLLF) advises that the final 3,000m leg of the 12,000m FY19 RC drilling program commenced 4 March 2019 on the Reptile Project within EPLs 3496 and 3497 and held by its wholly-owned subsidiary Reptile Uranium Namibia (Pty) Ltd. Deep Yellow Limited (ASX:DYL) (OTCMKTS:DYLLF) provides the Company&apos;s December Quarterly Activities Report. 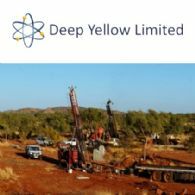 Deep Yellow Limited (ASX:DYL) (OTCMKTS:DYLLF) is pleased to announce that the resource infill drilling in the Tumas 3 West area, testing a southern palaeochannel tributary was completed. In addition a short exploration program in the Tumas Central palaeochannel commenced and stopped due to the Christmas break. Drilling will resume in February 2019 to complete this work. 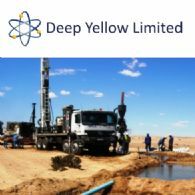 Deep Yellow Limited (ASX:DYL) (OTCMKTS:DYLLF) advises the completion of the 2018 exploration drilling program carried out on its Nova Joint Venture project, Namibia where Japanese Japan Oil, Gas and Metals National Corporation is earning a 39.5% interest on expenditure of A$4.5M. The drilling program started on 4 October and was suspended on 14 December 2018 to allow for the Christmas break. Deep Yellow Limited (ASX:DYL) (OTCMKTS:DYLLF) is pleased to announce that the resource infill drilling in the Tumas 1 East area on EPL3497, testing two of the five tributaries, has now been completed. Extensive uranium mineralisation has been confirmed within Tributaries 1 and 2. EPL3497 is held by Reptile Uranium Namibia (Pty) Ltd, part of the group of companies wholly owned by Deep Yellow. Deep Yellow Limited (ASX:DYL) (OTCMKTS:DYLLF) is pleased to announce that the current phase of broad delineation drilling in the Tumas 1 East area on EPL3497 has now been completed. Deep Yellow Limited (ASX:DYL) (OTCMKTS:DYLLF) is pleased to announce continued encouraging drilling results on EPL3497 where the recently discovered continuous mineralisation at the Tumas 1 East palaeochannel area (as announced 3 October 2018) has now been further extended and has also identified a new mineralised channel to the north. Deep Yellow Limited (ASX:DYL) Upgrades to Trade on the OTCQX Best Market in the U.S. Deep Yellow Limited (ASX:DYL) (OTCQX:DYLLF) (Namibian Stock Exchange:DYL) is pleased to announce that the Company&apos;s ordinary shares have been approved for trading on the OTCQX Best Market in the United States having upgraded from the OTCQB Venture Market. Deep Yellow Limited (ASX:DYL) (OTCMKTS:DYLLF) is pleased to report on encouraging drilling results on EPL3497 where new continuous mineralisation has been identified in the Tumas 1 East palaeochannel area. Drilling was also conducted in the S-Bend channel area to the north which did not identify significant mineralisation. 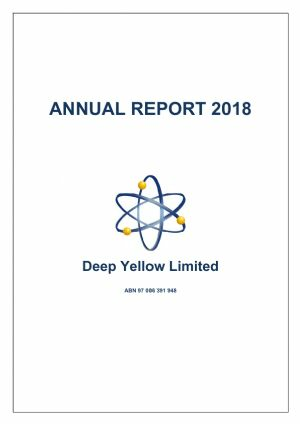 Deep Yellow Limited (ASX:DYL) (OTCMKTS:DYLLF) provides the 2018 Annual Report including audited financial statements for the year ended 30 June 2018. Deep Yellow Limited (ASX:DYL) (OTCMKTS:DYLLF) provides the Corporate Presentation to be given at the Sprott Natural Resources Symposium being held in Vancouver, Canada. Deep Yellow Limited (ASX:DYL) (OTCMKTS:DYLLF) provides the Company&apos;s quarterly activities report for the period ending 30 June 2018. Deep Yellow Limited (ASX:DYL) (OTCMKTS:DYLLF) is pleased to announce an updated Mineral Resource Estimate for the Tumas 3 deposit which, at a 200ppm eU3O8 cut-off now contains 31.2Mlb Inferred Mineral Resources at 377ppm eU3O8 an increase of 32% to the maiden Mineral Resource as announced to the ASX on 27 Sept 2017. 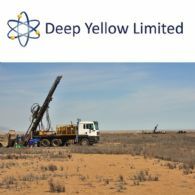 Deep Yellow Limited (ASX:DYL) (OTCMKTS:DYLLF) is pleased to report continued encouraging drilling results from the ongoing Tumas 3 resource extension drilling program carried out on EPL3496, held by its wholly-owned subsidiary Reptile Uranium Namibia (Pty) Ltd. Deep Yellow Limited (ASX:DYL) (OTCMKTS:DYLLF) (Namibian Stock Exchange:DYL) is pleased to announce that the Company&apos;s ordinary shares have been approved for trading on the OTCQB Venture Market in the United States under the symbol "DYLLF." The OTCQB is a U.S. trading platform operated by OTC Markets Group in New York. Deep Yellow Limited (ASX:DYL) (OTCMKTS:DYLLF) provides the Company&apos;s Quarterly Activity Report for the period ending 31 March, 2018. Deep Yellow Limited (ASX:DYL) (OTCMKTS:DYLLF) is pleased to advise that Japan Oil, Gas and Metals National Corporation, who are sole funding the Nova Joint Venture in Namibia, have approved a program and budget of $1.3M over the next 12 months for the period ending 31 March 2019. Deep Yellow Limited (ASX:DYL) (OTCMKTS:DYLLF) is pleased to report continued encouraging drilling results from the ongoing semi-regional exploration and Tumas 3 East resource drilling program which is being carried out on EPL3496. 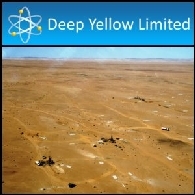 This EPL is held by Deep Yellow&apos;s wholly-owned subsidiary, Reptile Uranium Namibia (Pty) Ltd. Deep Yellow Limited (ASX:DYL) (OTCMKTS:DYLLF) is pleased to advise that a 10,000m RC drilling program commenced 12 February 2018 on the Reptile Project within EPLs 3496 and 3497 and held by its wholly-owned subsidiary Reptile Uranium Namibia (Pty) Ltd. Deep Yellow Limited (ASX:DYL) (OTCMKTS:DYLLF) provides December Quarterly Activities Report. Deep Yellow Limited (ASX:DYL) (OTCMKTS:DYLLF) is pleased to announce the completion of a 7,490m scout drilling program carried out on its Nova Joint Venture project, Namibia (Nova JV) where JOGMEC is earning a 39.5% interest. The drilling program started on 11 September and was completed on 13 December 2017. 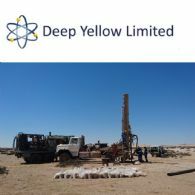 Deep Yellow Limited (ASX:DYL) (OTCMKTS:DYLLF) is pleased to report continued encouraging drilling results from the recently completed extension drilling at Tumas 3 located within EPL3496 and held by Deep Yellow&apos;s wholly-owned subsidiary Reptile Uranium Namibia (Pty) Ltd. Deep Yellow Limited (ASX:DYL) (OTCMKTS:DYLLF) is pleased to report that a 2,000m RC drilling program is commencing 3 November 2017 on its Tumas 3 uranium deposit in Namibia located within EPL 3496. Deep Yellow Limited (ASX:DYL) (OTCMKTS:DYLLF) provides the Company&apos;s Quarterly Activities Report for the period ending 30 September, 2017. Deep Yellow Limited (ASX:DYL) (OTCMKTS:DYLLF) is pleased to announce positive results from the early part of a 7,500m scout drilling program currently being carried out on its Nova Joint Venture project Namibia where JOGMEC is earning a 39.5% interest. Deep Yellow Limited (ASX:DYL) (OTCMKTS:DYLLF) is pleased to announce its highly encouraging maiden mineral resource estimate for the Tumas 3 discovery which, at a 200ppm eU3O8 cut-off, comprises 23.5Mlb inferred mineral resources at a grade of 382ppm eU3O8. This deposit occurs on EPL3496, held by the Deep Yellow wholly-owned subsidiary Reptile Uranium Namibia (Pty) Ltd. 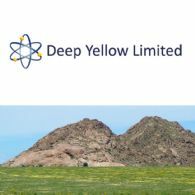 Deep Yellow Limited (ASX:DYL) (OTCMKTS:DYLLF) is pleased to report continued encouraging drilling results from the 10,000m drilling program currently underway on EPL3496, held by DYL&apos;s wholly-owned subsidiary Reptile Uranium Namibia (Pty) Ltd. 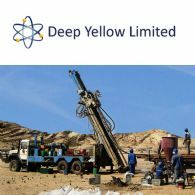 Deep Yellow Limited (ASX:DYL) (OTCMKTS:DYLLF) is pleased to provide the Company&apos;s latest Investor Presentation which also includes reference to recently announced positive drilling results from Deep Yellow&apos;s 100% owned Namibian Project. Deep Yellow Limited (ASX:DYL) (OTCMKTS:DYLLF) advises the attached letter was sent to shareholders today, 9 May 2017 in accordance with the notice requirements for the recently announced non-renounceable entitlement offer. Deep Yellow Limited (ASX:DYL) (OTCMKTS:DYLLF) advises that it plans to undertake a non-renounceable entitlement offer to raise up to approximately $15,117,405 before costs. Deep Yellow Limited (ASX:DYL) (OTCMKTS:DYLLF) is pleased to announce that it has signed a Strategic Alliance Deed with an affiliate of the Sprott Group. Deep Yellow Limited (ASX:DYL) (OTCMKTS:DYLLF) provides the following update on its activities undertaken during the March Quarter 2017. 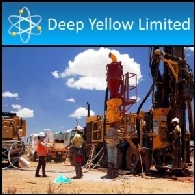 Deep Yellow Limited (ASX:DYL) (OTCMKTS:DYLLF) is pleased to report encouraging initial drilling results being returned from the first stage of a 10,000m drilling program that commenced in March 2017 on EPL3496 and EPL3497, held by DYL&apos;s wholly-owned subsidiary Reptile Uranium Namibia (Pty) Ltd. 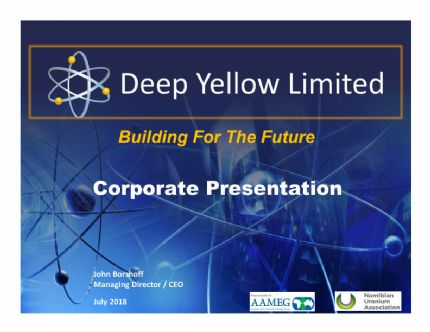 Deep Yellow Limited (ASX:DYL) (OTCMKTS:DYLLF) will be presenting the attached presentation to investors this week following the recent announcement of the landmark farm-in by Japan Oil, Gas and Metals National Corporation to the Nova Joint Venture in Namibia. Deep Yellow Limited (ASX:DYL) (OTCMKTS:DYLLF) is pleased to advise that it has entered into a strategic earn-in agreement with Japan Oil, Gas and Metals National Corporation to participate in the Nova Joint Venture in Namibia. 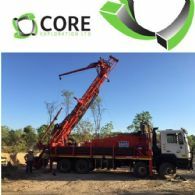 Core Exploration Ltd (ASX:CXO) is pleased to announce that it has received notification from the Northern Territory Government that Core is the successful applicant for a tenement over the Napperby Uranium Deposit in the NT, which included a 2004-JORC Inferred Resource of 9.34 Mt at 359 ppm U3O8 for 7.39 Mlbs. 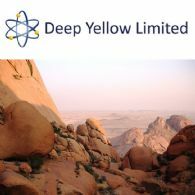 Deep Yellow Limited (ASX:DYL) (OTCMKTS:DYLLF) advises that the Namibian Ministry of Mines and Energy have approved the renewal of EPL3669 and EPL3670. Application for renewal was made in August 2015 and a 2 year extension has now been granted to 20 November 2017. 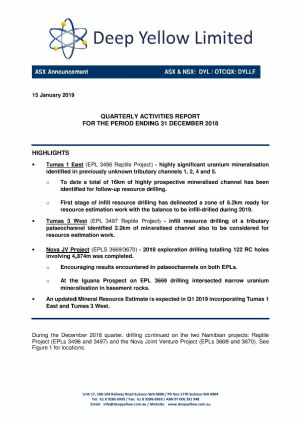 Deep Yellow Limited (ASX:DYL) (OTCMKTS:DYLLF) is pleased to provide the Company&apos;s Quarter Activities Report for the period ending 31 December 2016. Deep Yellow Limited (ASX:DYL) (OTCMKTS:DYLLF) is pleased to advise that a detailed review of the Company has been completed and a strategic growth plan has been developed; Executive Management will now focus its attention on execution and adding shareholder value. Deep Yellow Limited (ASX:DYL) (OTCMKTS:DYLLF) is pleased to provide the company&apos;s 2016 AGM Corporate Presentation. Deep Yellow Limited (ASX:DYL) (OTCMKTS:DYLLF) is pleased to provide its September Quarter Report and Appendix 5B. Deep Yellow Limited (ASX:DYL) (OTCMKTS:DYLLF) is pleased to provide a clarification to its recently announced JORC 2012 compliant Mineral Resource Estimate for its Tumas Project in Namibia, the MRE remains the same as that reported on 12 October 2016. Deep Yellow Limited (ASX:DYL) (OTCMKTS:DYLLF) announces the appointment of Mr John Borshoff as CEO and MD and the establishment of a strategic relationship with an affiliate of the Sprott Group (TSE:SII). Concurrently, an affiliate of Sprott will be making an initial A$1.42M investment to recapitalise DYL and support the Company&apos;s future growth strategy, anchored by its flagship Namibian assets. 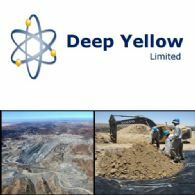 Deep Yellow Limited (ASX:DYL) (OTCMKTS:DYLLF) announces a JORC 2012 compliant Mineral Resource Estimate for its Tumas Project in Namibia. Apart from a 12% increase in metal content the confidence in the resource has been significantly enhanced with 62% now classified in the Measured Resource Category, 36% in Indicated and the remaining 2% in the Inferred Resource Category. Deep Yellow Limited (ASX:DYL) (OTCMKTS:DYLLF) CEO Investor Presentation was held on 4 & 5 October 2016 by the Managing Director Greg Cochran. FINANCE VIDEO: Deep Yellow Limited (ASX:DYL) (OTCMKTS:DYLLF) is pleased to provide an Executive Interview with Managing Director Greg Cochran and ABN Newswire CEO Tim McKinnon. Advanced stage uranium explorer Deep Yellow Limited (ASX:DYL) (OTCMKTS:DYLLF) is pleased to announce that it has entered into a binding Technology Licence Agreement ("TLA") with Marenica Energy Ltd (ASX:MEY) (OTCMKTS:MARXF) giving it the option to use MEY&apos;s U-pgradeTM process on its Tumas Project located in Namibia. Deep Yellow Limited (ASX:DYL) (OTCMKTS:DYLLF) are pleased to provide the Company&apos;s Annual Report and Financial Statements for 2016. Deep Yellow Limited (ASX:DYL) (OTCMKTS:DYLLF) is pleased to announce that the Company&apos;s Share Purchase Plan (SPP) closed on Friday 1st July 2016 with subscriptions for 188,150,000 ordinary shares. Advanced stage uranium explorer Deep Yellow Limited (ASX:DYL) is pleased to confirm the completion of the metallurgical testwork program that was conducted on bulk samples from the Company&apos;s Tumas Project located in Namibia. Deep Yellow Limited (ASX:DYL) (OTCMKTS:DYLLF) advises that Directors have resolved to extend the offer of shares under the Share Purchase Plan (SPP) lodged with ASX on 31 May 2016. The SPP will now close on 1 July 2016. Advanced stage uranium explorer Deep Yellow Limited (ASX:DYL) is pleased to provide a further update to its recently announced interim results from the metallurgical testwork program currently underway on bulk samples from the Company&apos;s Tumas Project located in Namibia. Advanced stage uranium explorer Deep Yellow Limited (ASX:DYL) is pleased to announce successful interim results from the metallurgical testwork program currently underway on bulk samples from the Company&apos;s Tumas Project located in Namibia.